The Republican presidential ticket offers criticism for Democrat Barack Obama. 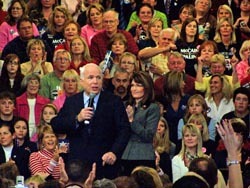 During a stop in Waukesha Thursday, GOP presidential nominee John McCain criticized Obama&apos;s positions on the war in Iraq, energy, and health care reform. McCain says the Democratic nominee&apos;s proposal would create a government-controlled health care system that has not worked in other countries. Alaska Governor and vice-presidential nominee Sarah Palin also attacked Obama&apos;s record on abortion, referring to his vote against legislation in the Illinois Senate to provide care for children “born alive” after botched abortions. Palin also asked voters to question if the media is reporting all sides of the issues. The two candidates took a number of questions during the town hall meeting, which was attended by several thousand people. They also made the push for more domestic drilling for oil, reforms to prevent election fraud, and staying in Iraq until U.S. forces achieve victory. McCain was also scheduled to appear in Mosinee Thursday and will be in La Crosse on Friday.